Founded in 1872, the Library of the National Foundation for Political Science includes one of the richest European social sciences collection on political science, economics, history, geography, law, international relations, and sociology. It is part of the Institut d’Etudes Politiques (IEP) of Paris and is associated with the French National Library, providing and sharing Political Science resources through library networks. 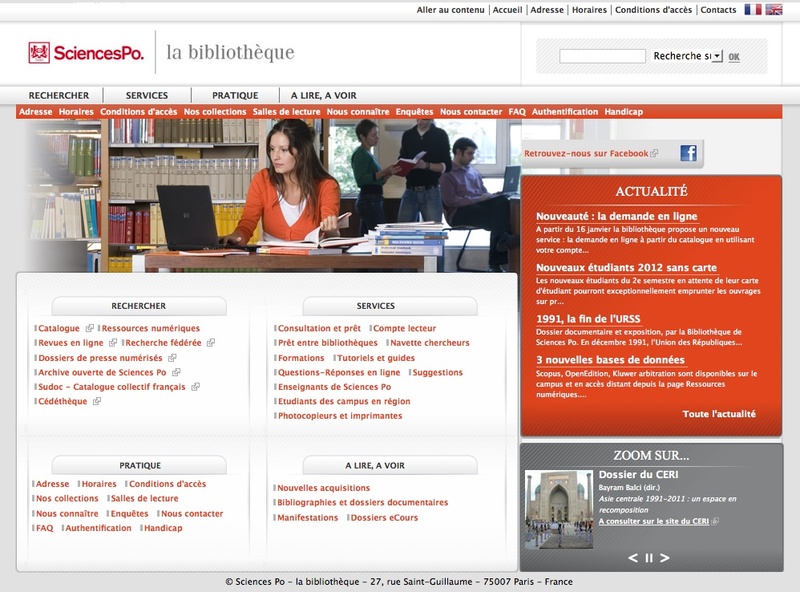 The library website – in French only (but some books and article annotations are available also in English) – provides access to its catalogues and online resources but the access for non-members is extremely limited. Only affiliated users can fully access and use the E-catalogues and only from the IEP campus or library-connected machines. External users can retrieve detailed metadata and abstracts – in shorter or longer format – of the desired records, which can be saved on-screen. A highly-refined multiple search feature help users to find materials in the several databases and downloading options are available in pdf format, with a different range of possibilities for members and non. Navigation is quite easy even if all pages are in French, thanks to a clear content organization and self-intuitive categories.